Almond just arrived from the Daytona race track on October 19th. She also raced part of her 53 races at Orange Park and Wheeling Downs. Almond has been retired since May 12th so has been in her trainer's kennel at the track waiting for some time for a group to take her. She is 61lb very light fawn female that turned 3 on May 17th. Her sire is Little Andy and her dam is WS White Sale. She is used to being around the kids of her trainer at the racing kennel. They help their mom with turnouts and feeding the dogs. Almond is a sweet girl that passed her cat test with just a little initial interest. She lost interest quickly though. She has been fine with the cats in her foster home since she walked in. 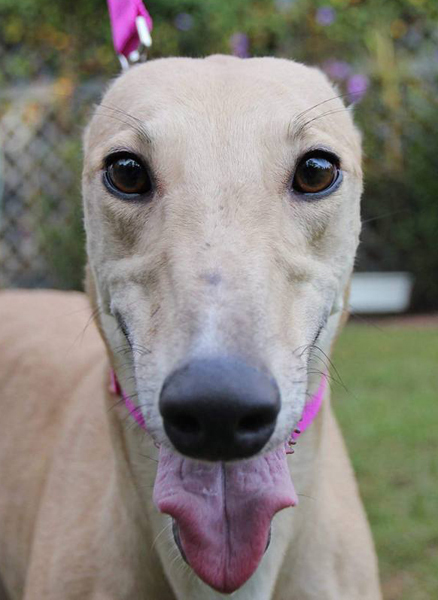 Almond is a pretty calm, well behaved girl that is perfect on leash. She enjoyed snuggling with her foster mom when she laid down near her on the floor. More as we get to know her.